My brother Dave and I just returned from an outstanding first visit to Africa for plains game hunting in north-central Namibia with Johann and Vera Veldsmann of http://www.shona-adventures.com/ booked through Ann Horsman of Aspen Hill Adventures with travel arrangements by Kathi Klimes of Wild Travel. Things started out off kilter leaving from Indianapolis when our flight was held on the ground there for 40 minutes because of congestion over Dulles. Our SAA flight to Johannesburg was scheduled to leave Dulles at 5:29 p.m., and we got to the gate at 5:05 only to be told by the gate attendant that the SAA flight closed for boarding 30 minutes BEFORE takeoff. We were stunned to say the least as I have never heard of such a thing in my life. So after standing in line at the United customer service center counter for three hours, the guy there booked us to Heathrow with a five-hour layover, then to Munich on Lufthansa, then on to Windhoek on LTU, which I had never heard of. Heathrow was the ugliest, smokiest airport I have been in, and Munich was lovely in comparison. We arrived in Windhoek the morning of the 12th, only to find the luggage and rifles had not come with us. They arrived the next day and were delivered to us at Avondschaduw Farm west of Otjiwarongo the morning of the 14th. Among other things, it seems LTU does not carry firearms baggage, so our stuff finally made it out of Heathrow on an SAA flight. Delayed luggage was only a minor inconvenience, though, meaning we hunted the first day in Nike sneakers with borrowed rifles. I used Johannâ€™s CZ .270 on my old warthog boar the evening of the 13th. Hunting in thorn savannah, we saw dozens of kudu (including several â€œlast-day bullsâ€ in the 48-inch class), gemsbok and warthogs right away, along with duikers, steenbok and game birds galore. On the 14th, we climbed a kopje, spotted some gemsbok feeding 800 yards off and made a stalk. My brother, using my freshly arrived CZ 550 in 9.3X62, put a Barnes 250 TSX right in the sweet spot for a quick kill at 87 yards. 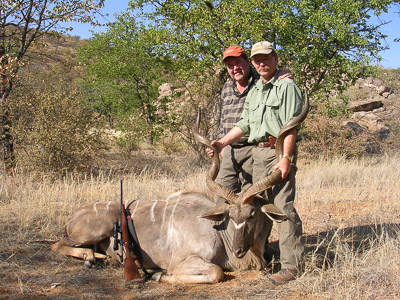 His trophy was a lovely gemsbok cow with narrow 40-inch horns. We were thrilled. We see our first puff adder, a young one about 30 inches long and just beautiful even if a bit sobering. On the 15th, I take a gemsbok bull from the kopje, a downhill neck shot at about 130 yards, but although he is an old bull, he has only 32-inch horns, and Johann tells me this one will go for meat rations as a management bull, and I will have another chance. When we get up to him, he struggles to his feet as a result of the infamous just-missed-the-spine-and-stunned-him syndrome, and Johann and I both finish the bull with our CZ 9.3s at less than 20 yards, glad that he was heading away and not toward us. Brother Dave, left with our tracker Tjokkie at a waterhole for the late afternoon, takes a warthog boar with nicely curved and perfect tusks â€“ a bang-flop at about 70 yards with Johannâ€™s 9.3 and 250-grain TSX loads. On the 16th, I get a chance at a very fine gemsbok bull crossing a fence lane at only about 65 yards. It is just past sunrise and I must fire quickly off the sticks and manage to make my worst shot of the trip, slapping the bull in the ham just as he gets to the brush. We quickly lose his trail, and after scouting and casting about for more sign, eventually conclude that the bull is lost. So my gemsbok hunt is over for this trip, and of course, I feel like a damned idiot to blow such an easy opportunity so badly. I probably would have been fine with an offhand shot, but now the sticks have me nervous. LESSON: Practice, practice, practice shooting off sticks, and not just a half-dozen or so shots that seem â€œgood enough.â€ Shoot at 150 yards or more, and give yourself just three seconds to mount the sticks and pull the trigger. If you are consistently hitting a teacup under those conditions, youâ€™re ready. If not, YOU ARE NOT and donâ€™t kid yourself about this. All my issues with the tripod sticks are with windage; elevations are fine. We decide to move on from the Avondschaduw/Omizure bush camp to see Johannâ€™s new operation, Tualuka Lodge (formerly known as Ondundu Lodge) on the Huab River south of Kamanjab. The bush camp at Avondschaduw with its lovely boma and fire was quite nice, but Tualuka is stunning. After getting settled in our chalets, we take a drive along the now-dry riverbed to get a sense of the game, and see five kudu bulls well over 52 inches in a couple of hours including one old boy with an estimated 57-inch right and a broken left horn. These are in addition to scores of gemsbok, as well as baboons, duiker, steenbok, klipspringer (love those ears! ), rock hyrax, etc. We also see brown hyena, leopard, mountain zebra and elephant tracks, along with the usual assortment of jackal, porcupine and aardvark prints. On the 17th, we set out on foot from the lodge up the river, hoping to spot and stalk a kudu bull. We see only a fraction of the game from the night before though, as the animals are still up in the hills feeding before the late morning/afternoon heat. We do, however, find plenty of mopane bees. But as they do not sting or bite, but only want a drop of your sweat to use in honey-making, they are tolerable. Dave has a brief chance at a kudu bull, but holds off for a better shot. On the way back to the lodge for lunch, I make my only decent shot off the sticks for the whole trip, taking an old male baboon between the shoulder blades at 150 yards. Their odor is as distinctive as their various shouts and screams. In the afternoon, we cruise the scrub tracks in a modified Toyota Land Cruiser (no crap British Land Rovers anywhere in Namibia that I saw) and spot a nice kudu bull feeding in a grassy opening. After a brief but very careful stalk, Dave nails his bull just above the heart from the sticks at possibly 60 yards, and breaks it down for good at 150. The bull will measure 53 and 52 inches, with nice mass, and we are both thrilled and awestruck by the size of these guys. There are cold beers back at the lodge, and brandy toasts, to which we are becoming pleasantly accustomed. On Friday the 18th, we climb a very rough track to the plateau above the Huab plains under cloudy skies and distant virga purple in the light of the rising sun. From the top of a granite kopje we hear a leopard roar, then spot an excellent kudu bull perhaps 450 yards off that Johann and I attempt to stalk, but he slips away. From another kopje in the shadow of a white silver chestnut tree, however, we spy what turns out to be three mountain zebra and I shoot from the rocks at the nearest one feeding at an angle quartering away from below (I have not seen the other two). I hope to go in through the rib cage and break the opposite shoulder, but overestimate the angle and strike too far back, with the bullet entering the left flank and exiting about four inches behind the off shoulder. Still, the zebra is hit pretty hard and peels away from the others in a circle toward the base of our kopje. I fire two more times, putting one other bullet in a very similar location as the first, then Johann breaks the spine with one of the Barnes solids he keeps in his rifle, as we are in elephant country. I have told Johann that I am very comfortable with him shooting as well once the affair is opened in order to help me get my animal down quickly and humanely. Considering my disappointing shooting so far, a quick kill is vastly more important to my values than the ego satisfaction of firing all the shots myself. LESSON: Because zebra have no horns and therefore tend to look much the same, keep a very close eye on the one you have shot as it is easy to confuse another for the one you have wounded. I am still haunted by the possibility that I might have put the missing bullet into another zebra in the confusion, although the other two vanished quickly enough without showing signs of injury. On Saturday the 19th, the morning dawns chilly and I am glad for the borrowed jacket in the Toyota. We see perhaps 50 gemsbok and a number of kudu cows and calves, when about mid-morning we glimpse a cow with two bulls, one of them looking like a good one, especially as we have just one more hunting day after this. We park the rig and set off at a fast clip hoping to mount the shoulder of a granite boulder ridge to have a better look at the bigger bull. After a quarter mile or so of double-time stalking and climbing, Tjokkie spots movement and we spread out like spiders over the granite boulders with our glasses focused ahead. The cow, then the smaller bull slowly walk/feed out from right to left about 65 yards ahead of us, and we wait for the bigger bull, but he doesnâ€™t show. We are baffled, when Tjokkie notes the branches of a kudu bush not 30 feet from us are moving. We slither closer, and thereâ€™s our bull right below us, feeding. I put my scope on him, but can only see one horn, one eye and two inches of neck as he stares back at me. After perhaps two minutes of this, my elbows on the granite are starting to ache, and I am wondering how long this stare-down will last when the bull decides he doesnâ€™t like the situation and turns to leave. I stand and put a bullet just right of his spine just back of his shoulders, staggering him, but he is not down by any means. I give a PH-style Texas heart shot just right of the tail, and Johann matches me just left of the tail. The bull wobbles for another 30 yards then goes down, and I break his neck. I have my kudu, at about 51 inches not a big one, but I am very happy to have completed my first African hunt. The bull is wide, with good bases, and at least 150 pounds heavier than Daveâ€™s bull. This kudu business could get addicting. On Sunday the 20th, our last day, we hunt for Daveâ€™s zebra. We have seen scores, if not hundreds of fresh mountain zebra tracks over the past several days, but have only spotted the three, so are not terribly hopeful. We cover a lot of ground and climb many kopjes in hopes of spotting the elusive stripes. Finally, from the kopje where I killed my zebra, we spot four feeding in the thorn with an unknown number of gemsbok perhaps a kilometer away. They are moving slowly in our direction, but so slowly that we leave the kopje for an hour and check other areas in hopes they will have fed closer. When we return, they have stopped feeding about 400 yards away, and one even seems asleep on his feet. It is too far for a shot and we canâ€™t get to them from any point of elevation that would help close the gap. After watching them for an hour, Johann decides our best chance is a direct stalk, so we descend the kopje and strike for their location through the mopane and thorn, hoping not to bump a gemsbok first. We are aided by a good breeze blowing from the right perpendicular to our route that keeps our scent away from the zebras and muffles our steps. Still, we take special pains to stalk as quietly as absolutely possible and gladly trade the scratches of unnoticed head-high thorns on our cheeks for keeping a close eye on the ground for twigs that would snap underfoot and give us away. Suddenly, Tjokkie motions for a halt and absolute silence, then peers around a kudu bush. Tjokkie is very excited, and motions Dave up as he carefully sets the sticks. Dave peers around the bush, sets the rifle and quickly fires. He has just broken the neck of a fine stallion not 27 yards away! He puts one more in between the front legs of the prostrate stallion for insurance, and our hunt is over. We are all thrilled to have taken this zebra under these conditions on our last day. All in all, Johann has led us to nine animals in eight days of steady hunting, and we have taken some very pleasing heads. The scenery and game have been tremendous. The food has been hearty and delicious. The beer has been cold, the brandy warming and the friendship and camaraderie are woven forever into the fabric of my memory. I have been humbled, if not shamed, by my poor shooting, but Johann says it is a part of hunting and you just try to do better the next time. â€œJagd ist Jagd,â€ as the Germans say. I have gained more field hunting savvy in this long week than in all my decades of hunting deer here at home, and look forward to returning with a better eye and more steady field aim as soon as I can possibly afford it. There is simply no place like Africa. I used a CZ 550 American in 9.3X62 with Leupold 4X scope. Load was WLR primer, Lapua case, 61 grains Re 15 and Barnes 250-grain TSX for about 2550 fps. Although an accurate load, I found that in tweaking the sights on arrival in camp I ended up with about 8 inches drop at 200 meters. I later found that the stock screws had worked loose either in transit or after a couple of days of bouncing around in the hunting rig, putting the bullets four inches high and two left at 100 meters. LESSON: When you get to camp, shoot at 100 and 200 meters. Also check all screws on arrival, then again after a couple of days. We also brought a Savage 99 in .300 Savage, but scope wander and concerns about enough energy led us to hunt with my 9.3. No problem sharing it with my brother. Next time: Bring quiet camo clothing in any of the U.S. sporting patterns such as RealTree, Mossy Oak, etc. Only military patterns are banned, and the camo really helps. Leave your khaki ball cap home as it looks like a beacon to game. I soiled mine by rubbing in dirt, and that helped. Also, I am glad I brought my old Boy Scout compass along. I have a sound sense of direction here at home, but was hopelessly disoriented in the Southern Hemisphere autumn. I really hate not knowing my directions. Costs: Our 2X1 8-day package with Shona Adventures included airport pickup, food, lodging, the PH, the tracker, the skinners and a warthog, a kudu and a gemsbok each for $3400 per hunter. The zebras were added for $950 each. From my perspective as a first-time African hunter, this was a hell of a package, and we were tickled with accommodations as well as with Johann, Vera and their wonderful staff. I would most heartily recommend Shona Adventures again and Tualuka Lodge is simply enchanting, and a great place for the wife and kids, too. Please feel free to PM me with any questions. I have to thank Ann Horsman for directing me to Johann and Vera at Shona Adventures, and of course, I owe a huge debt to the “family” here at AR for their wonderful support, patience and encouragement in making an African hunt a reality. Guys, GO TO AFRICA NOW! © Copyright 2018 - 2019 Shona Hunting Adventures.